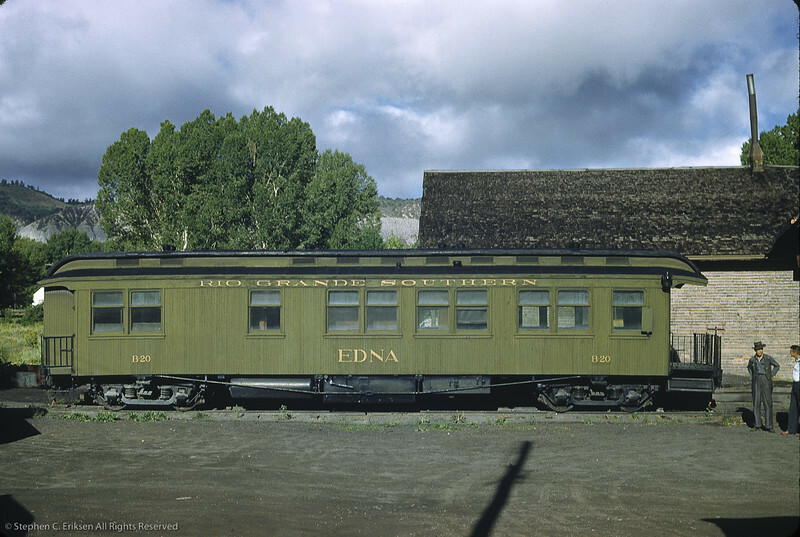 Original photographic images from the collection of Stephen C. Eriksen. 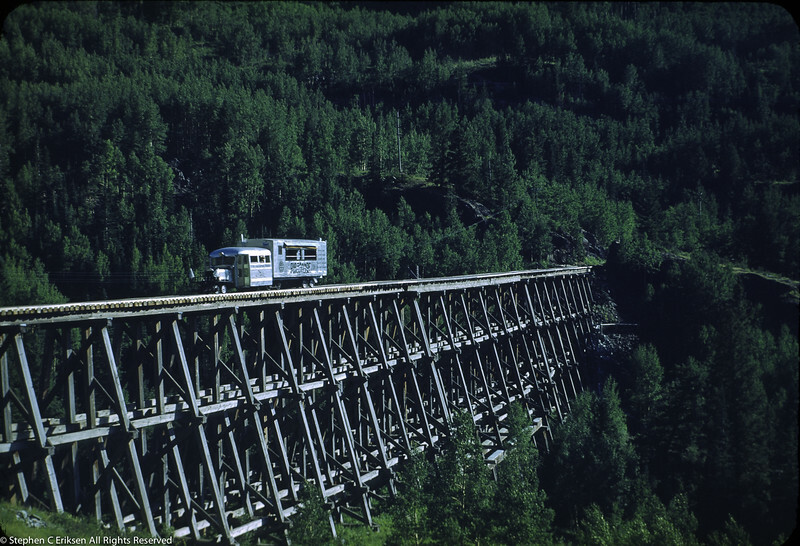 No commercial utilization without express written consent. 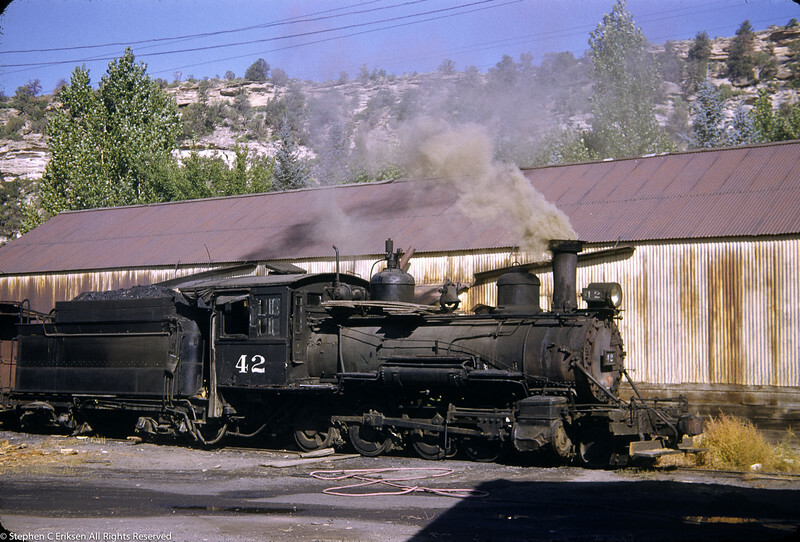 1950's view of RGS C-17 #42 under steam, now on display at the Durango roundhouse of the D&SNG RR. 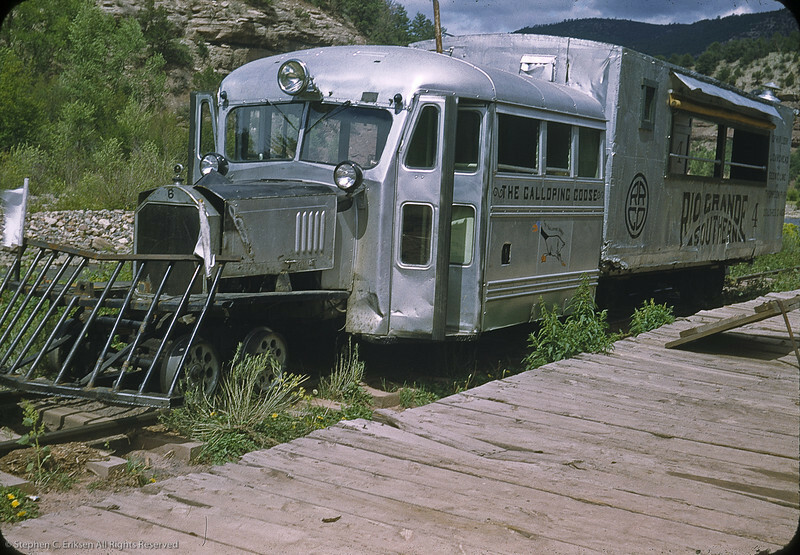 1950's view of Galloping Goose #3 at Placerville, CO. You can ride this Goose at Knott;s Berry Farm in Southern California today. 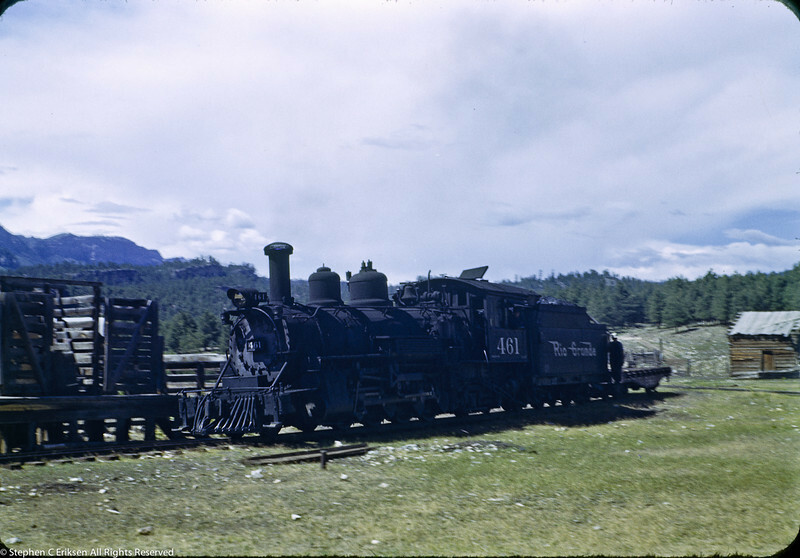 K-27 #461 is shown at Rockwood in this view from the 1950's. 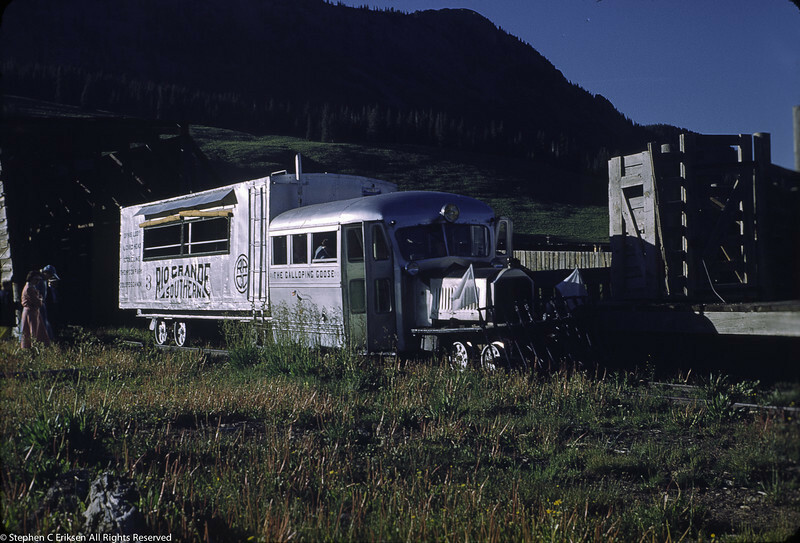 1950's view of the Wayne bus bodied Goose on the RGS. 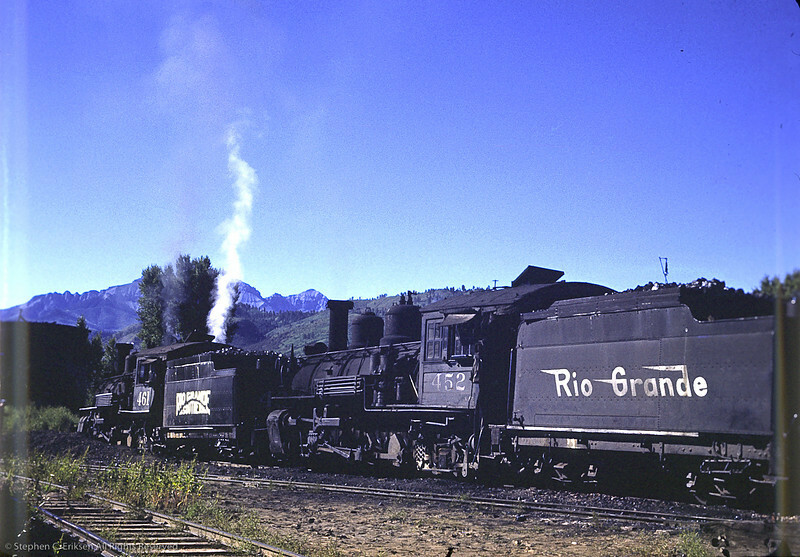 Goose 5 at Ridgway in 1950. 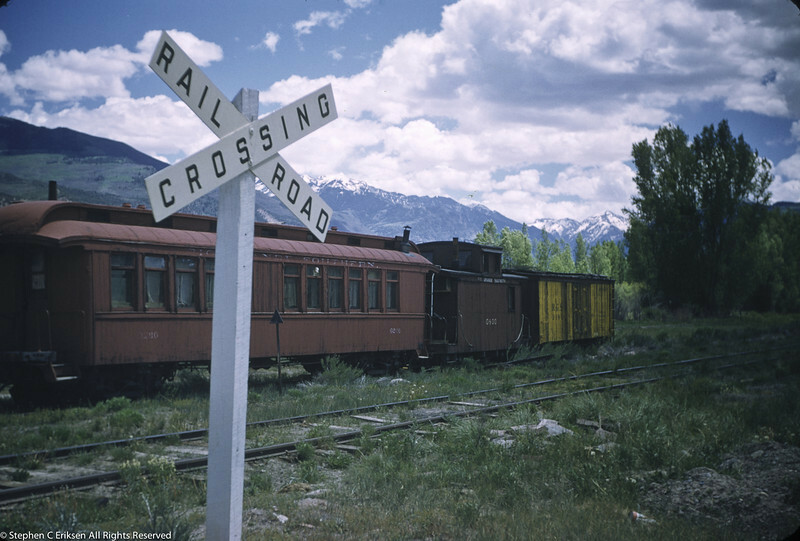 Photo by William F. Hellgren. 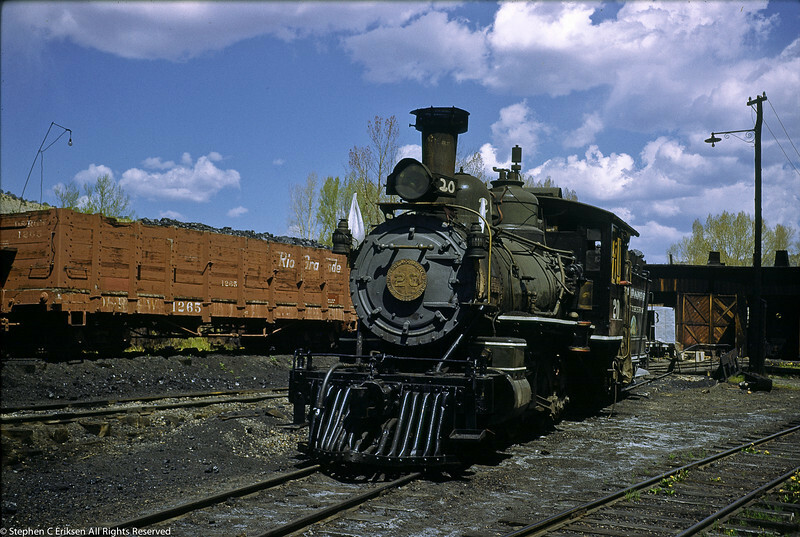 Look at the condition of Goose #2 in this view from the 1950's. 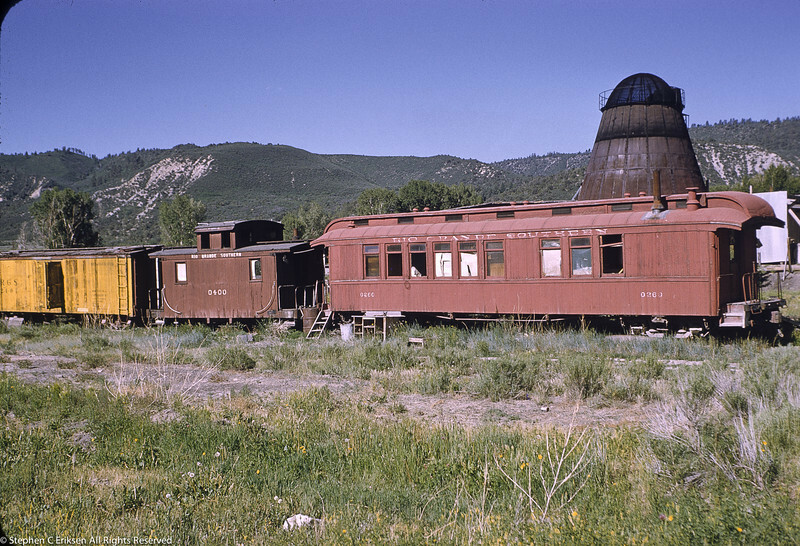 What a difference from the current condition at the Colorado Railroad Museum in Golden! 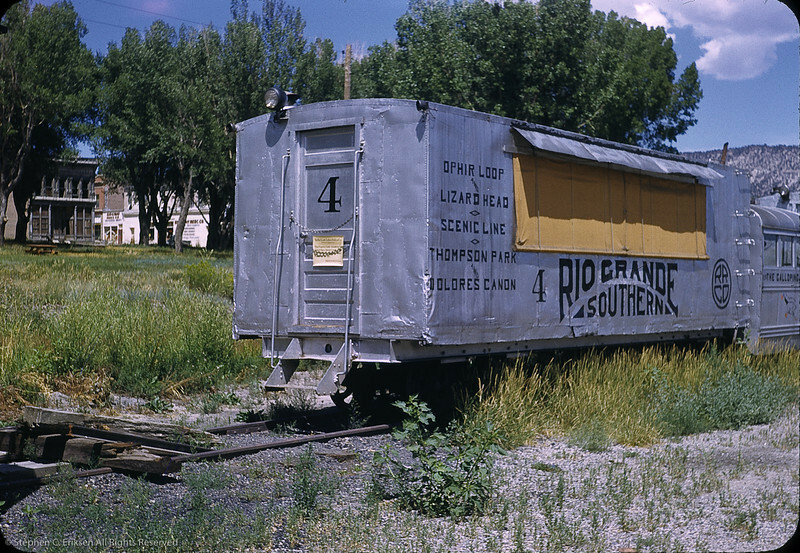 Goose 4 at Ridgway in 1950. 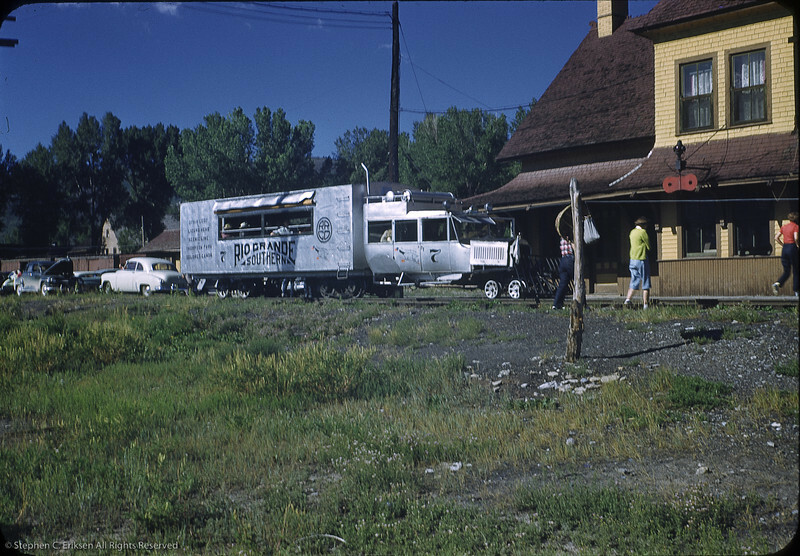 Photo by William F. Hellgren. 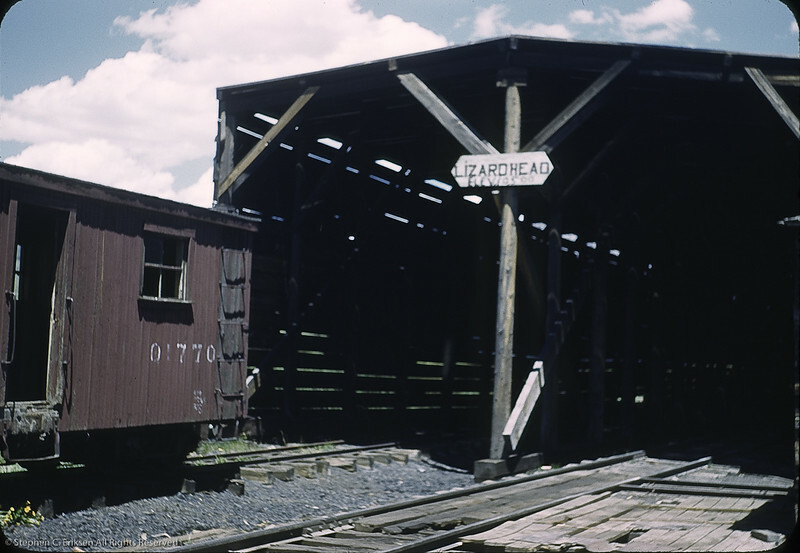 Lizard Head snowshed in 1950. 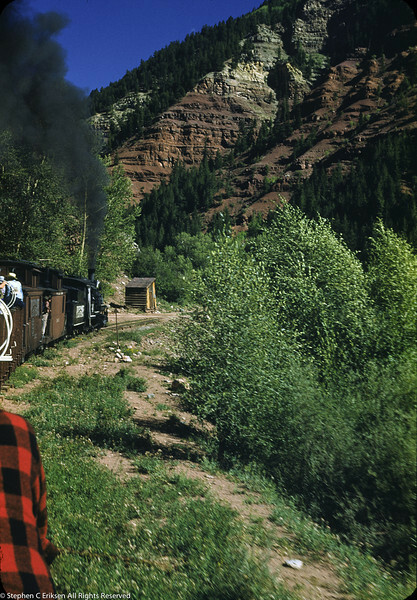 Photo by William F. Hellgren. 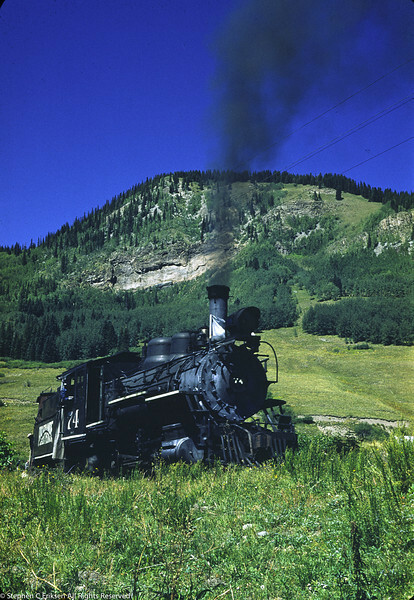 1950 image of K-27 #461 near Lizard Head Peak in Colorado. 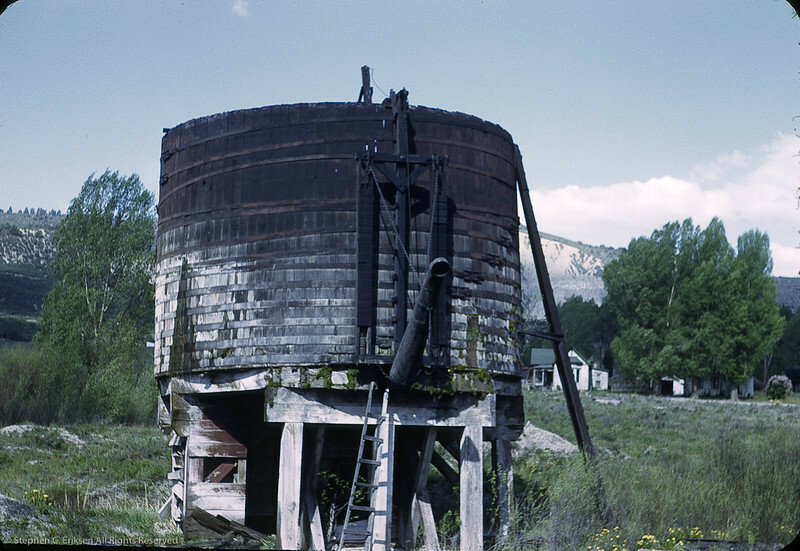 Water tank at Ridgway in 1950. 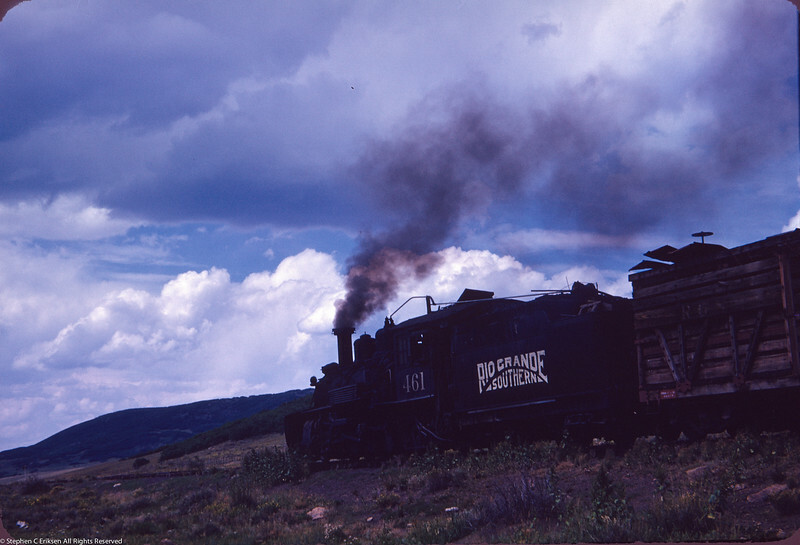 Photo by William F. Hellgren. 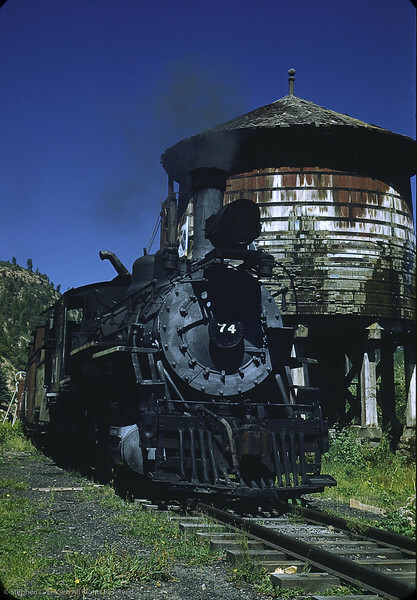 RGS #74 captured at Valley View, CO in this 1950 view by the esteemed photographer Robert LaMassena. 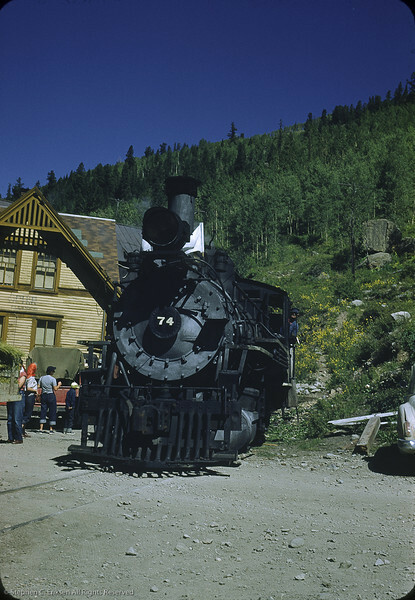 Vanadium Colorado Robert LeMassena photo of RGS #74 on a fan excursion. 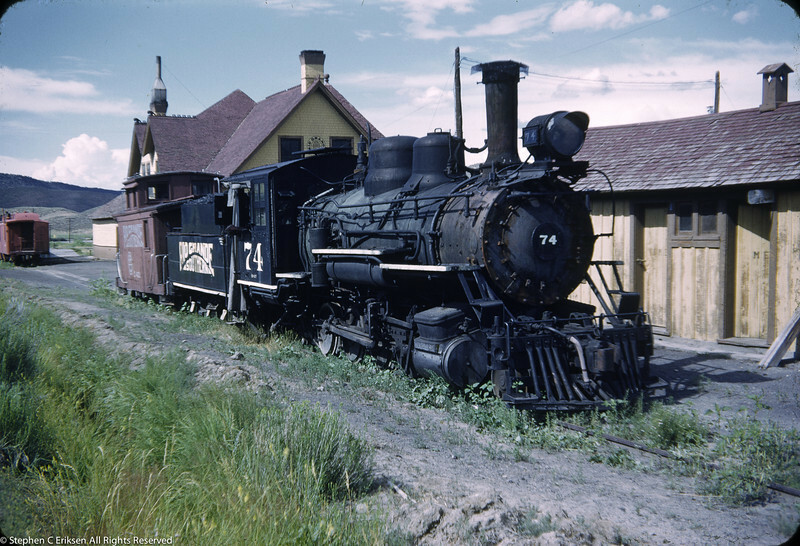 RGS #20 sits outside the Ridgway roundhouse on a beautiful June day in 1950. 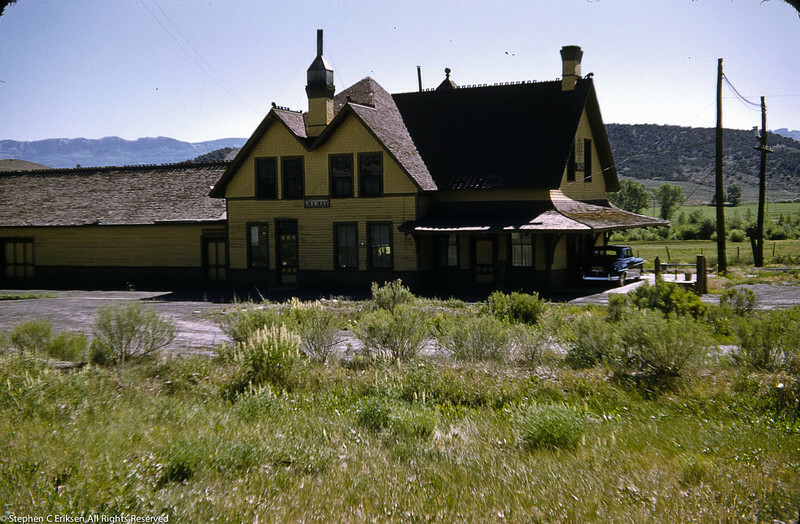 Goose #3 in June 1950 sits next to the station. 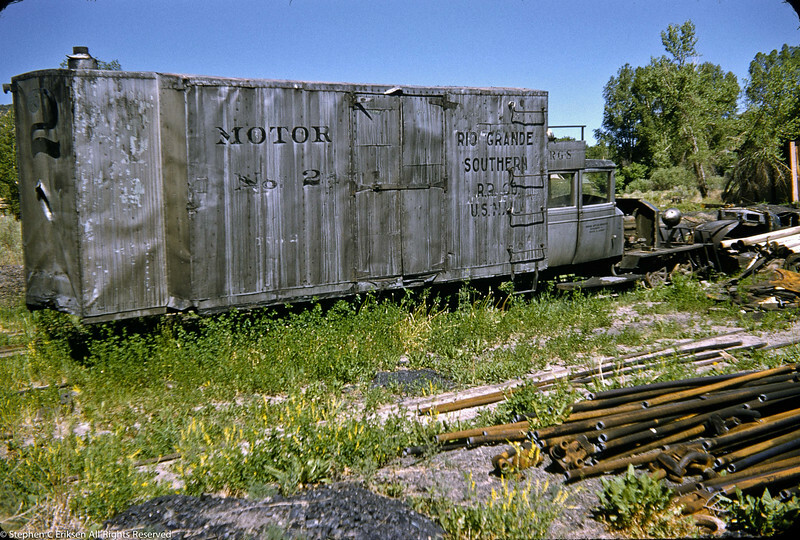 A short time later it would end up in Southern California at Knott's Berry Farm. 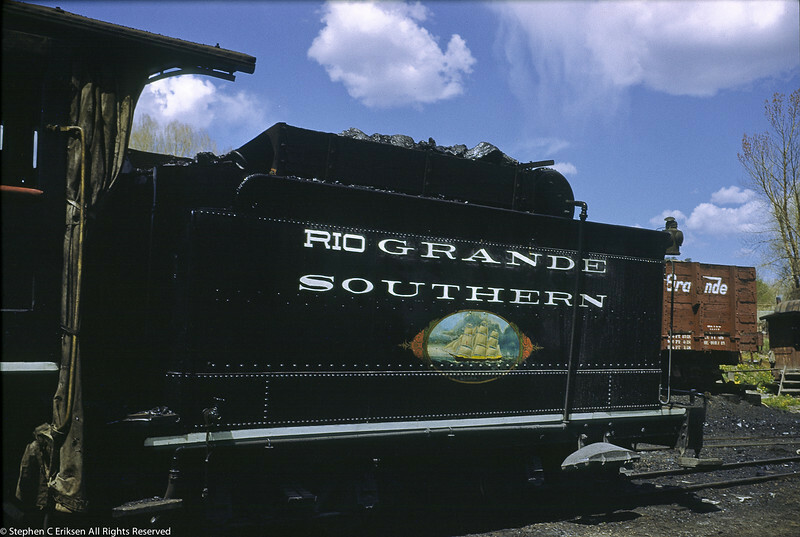 RGS #20 at Ridgway in June of 1950 with the Emma Sweeney clipper ship painting still intact on its tender. 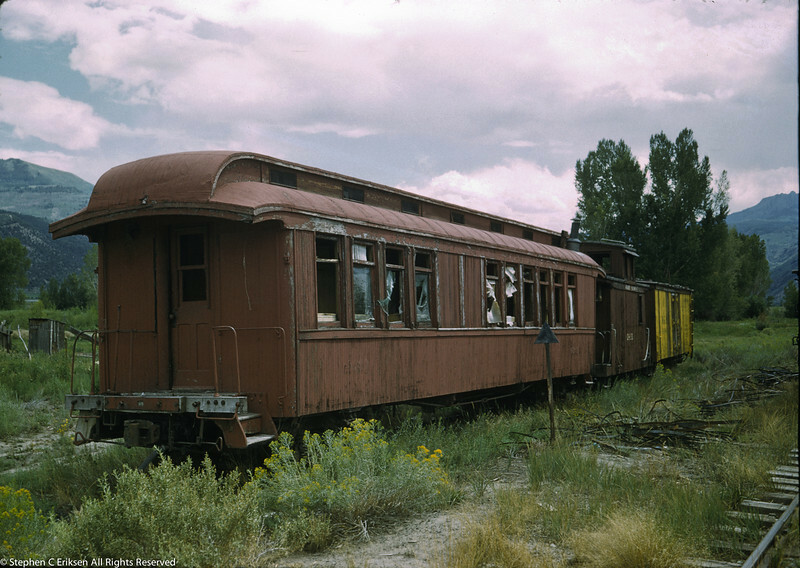 This July 1950 view shows Goose #3 ready for departure. RGS #74 at Trout Lake. View by Robert LeMassena. 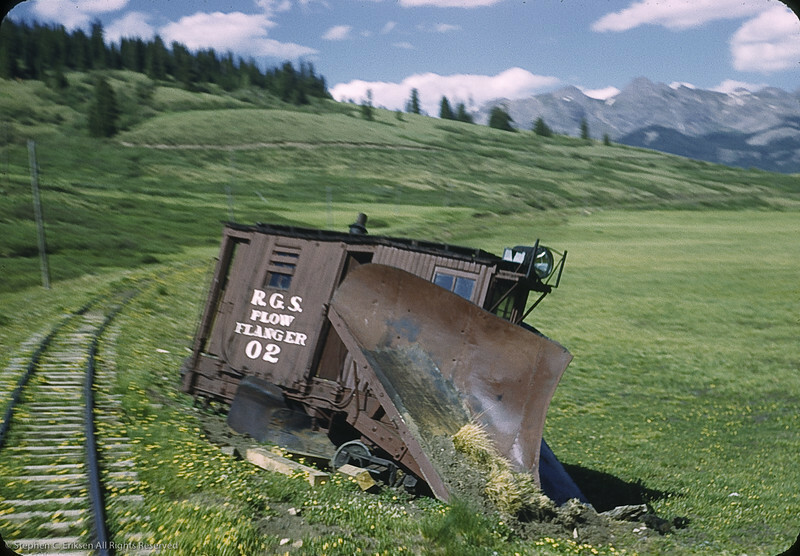 Wreckage of Plow Flanger 02 at Dallas Divide in 1951. 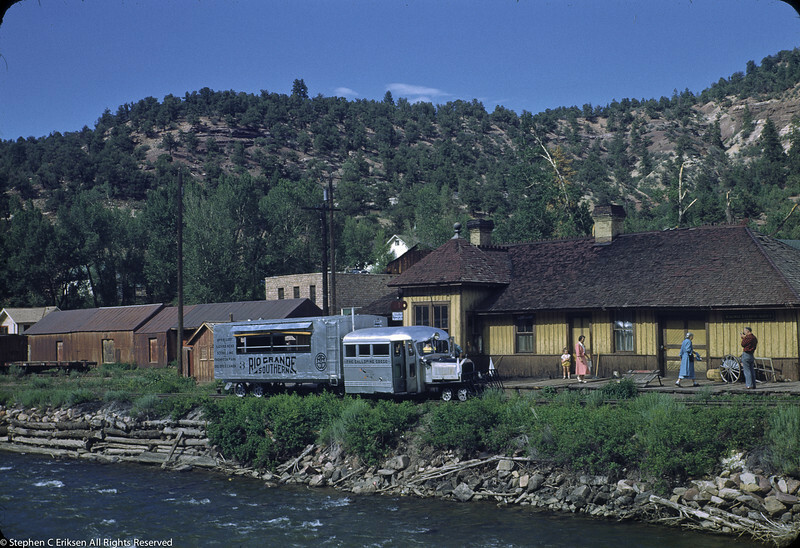 Photo by William F. Hellgren. 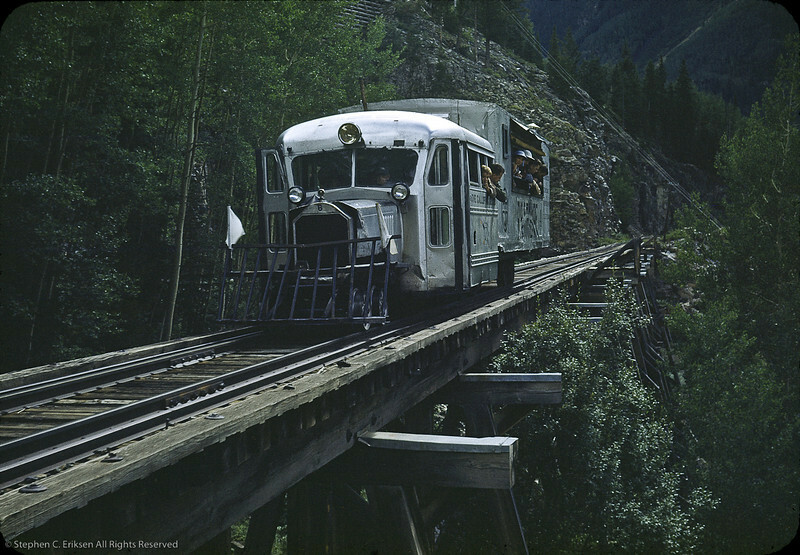 Goose 4 at Ophir trestle in 1951. Photo by Robert LeMassena. 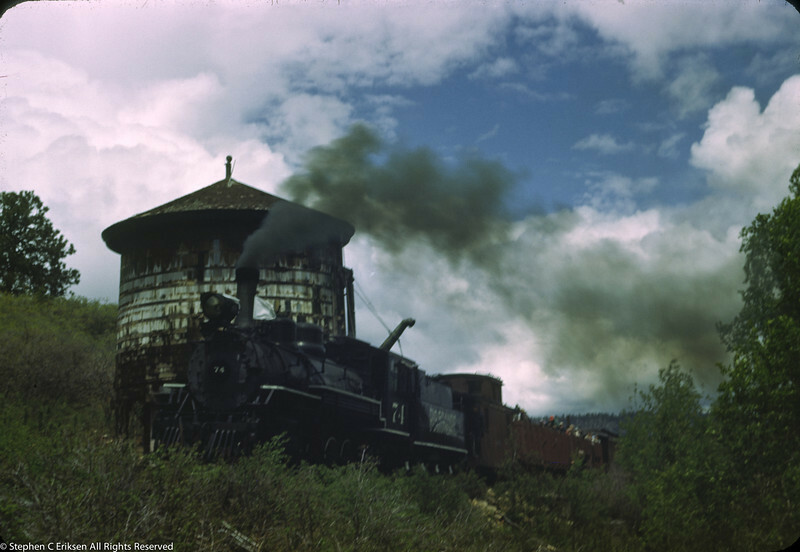 Fan excursion with RGS #74 on Sepember 2nd, 1951 as captured by Jack Pfeifer. 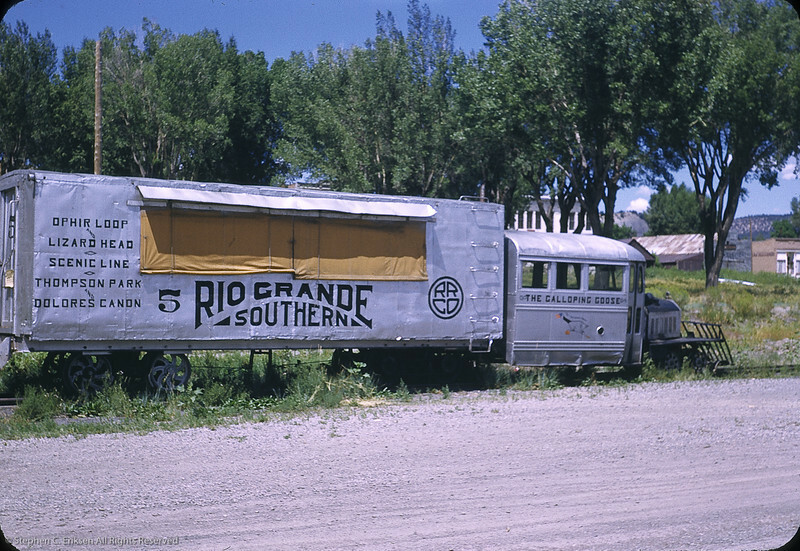 July 31, 1952 view of RGS #74 in Ridgway. 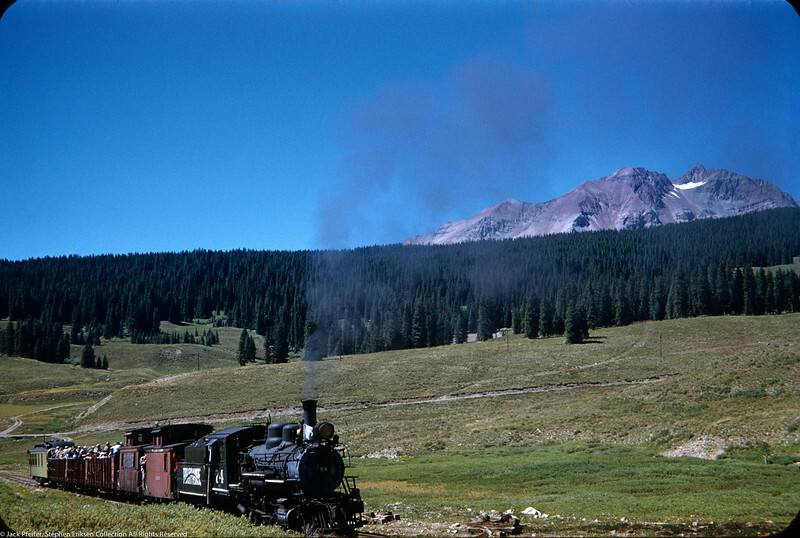 July 31, 1952 view of Goose #5 in Ridgway. 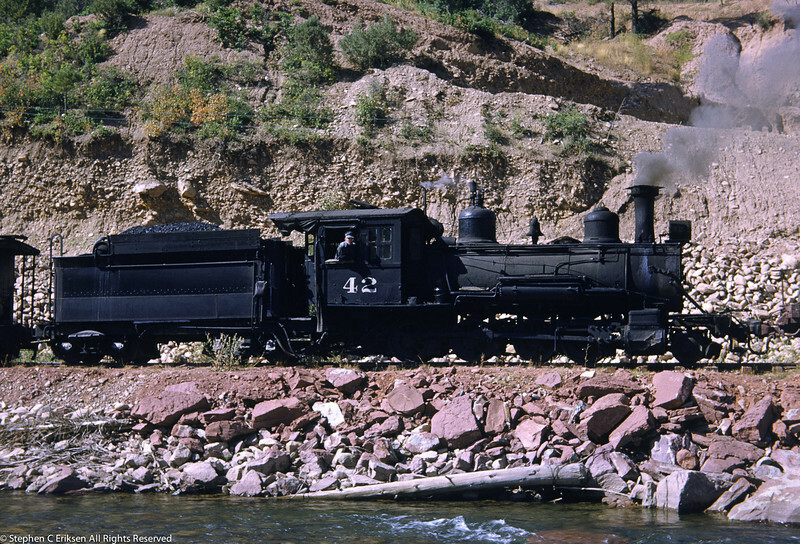 September 15, 1952 view of C-17 #42 at Dolores Colorado. Photo by Jack Pfeifer. 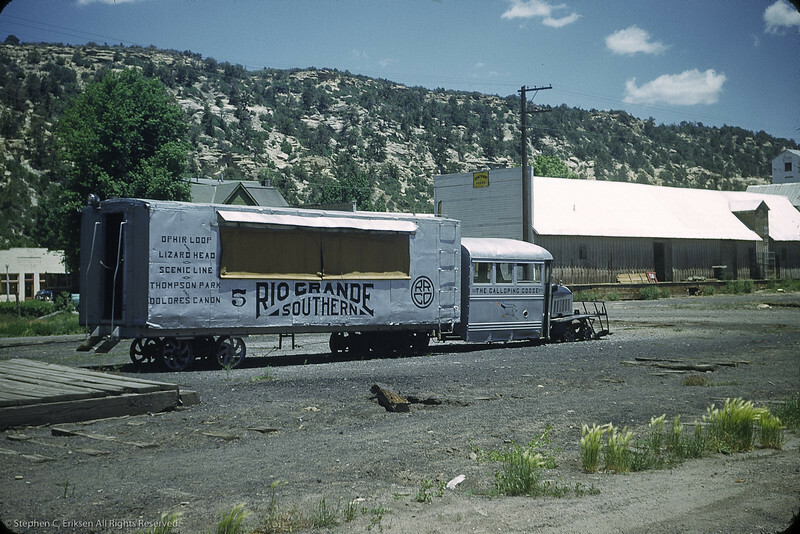 June 1, 1955 shows RGS coach 260, caboose 0400, and a refrigerator on display in Ridgway in the waning days of the railroad. 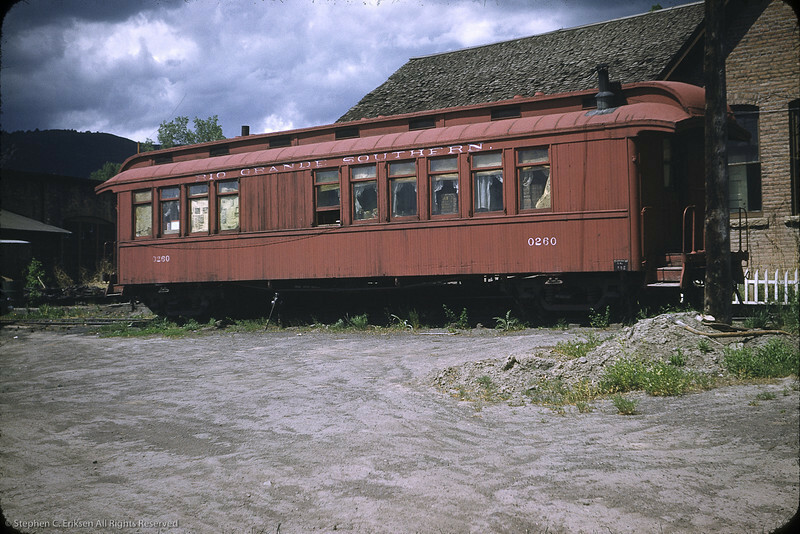 Coach 260 went on to the Huckleberry Railroad in Michigan where it operates today. 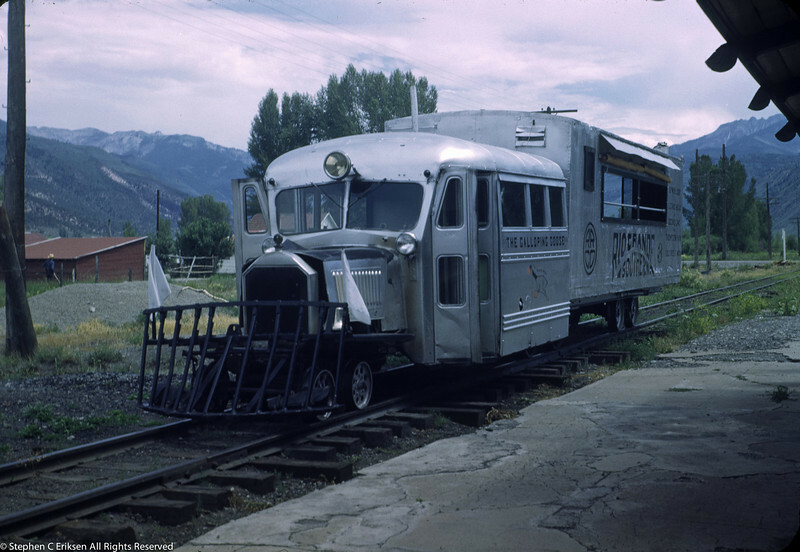 Caboose 0400 is currently at the Colorado RR Museum along with reefer #2101 (which may be the one shown in this photo). 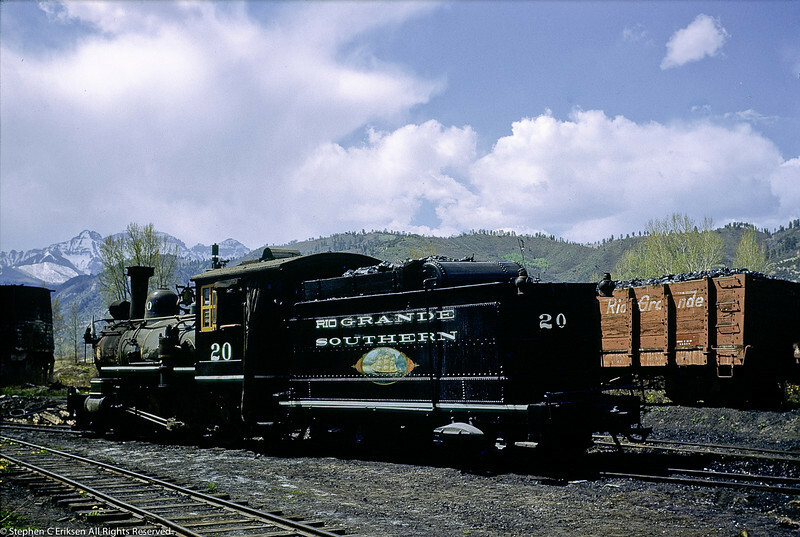 June 8th, 1956, RGS #20 and #42 have found a new home at Robert Richardson's Narrow Gauge Motel in this shot by C. G. Parsons. 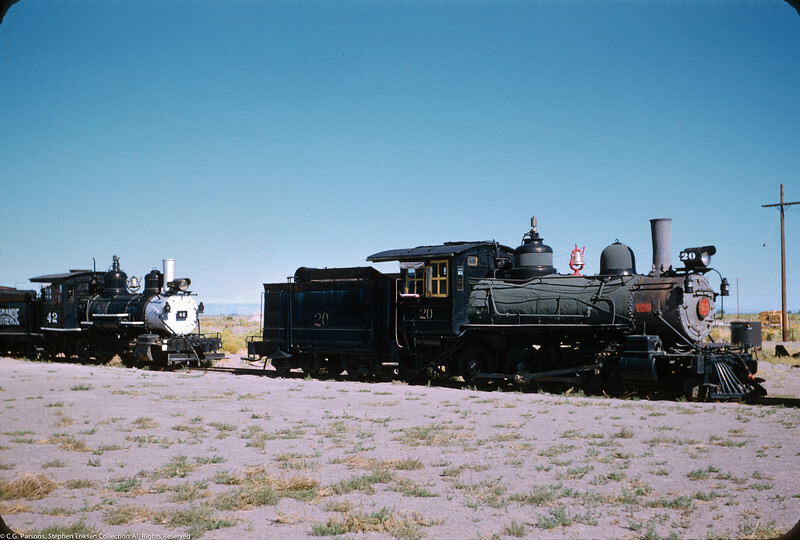 Ridgway June 1958 view of coach 260, caboose 0400 and reefer 2101. 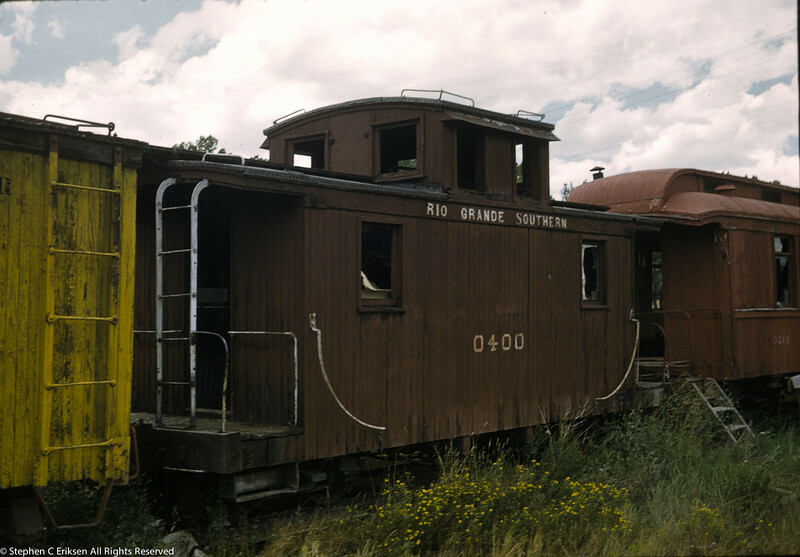 August of 1959 view of caboose 0400 in Ridgway, CO. Don Swanson photo. 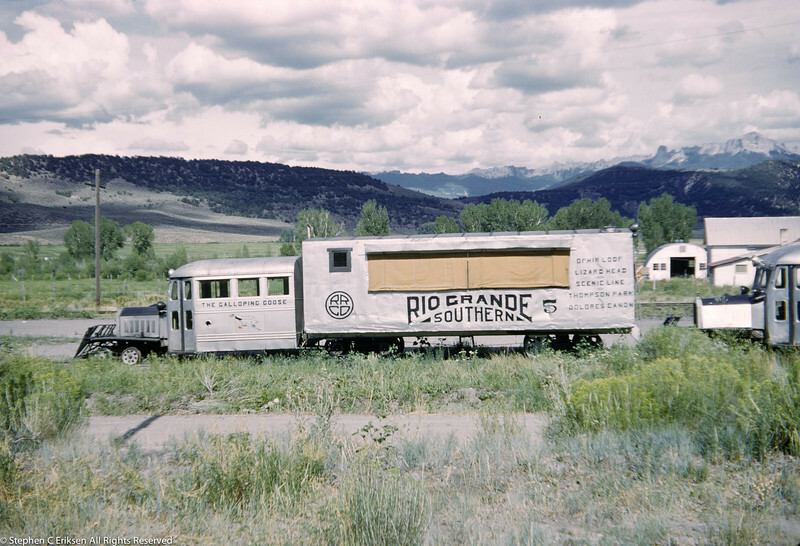 Coach 260 still sitting in the same spot on a track in Ridgway, CO in August of 1959. 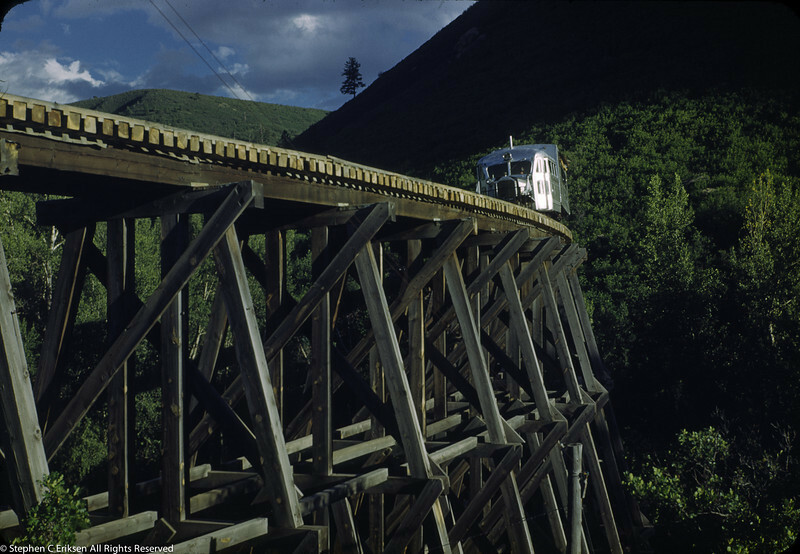 Photo by Don Swanson.